So we did, and sure enough got tickets on our third visit without any problem at all. We even managed to elicit a departure time from the ticket seller - something we'd had trouble with with Yaseen, as he routinely got his am's and pm's mixed up. We need to be at the station at 7am on Monday morning. The train trip is 36 hours, and it connects with the ferry, which is fortunate as apparently the train's frequently late. We have a sleeping compartment, and are anticipating a pleasant journey. While it's nice to have the logistics organised, it's also a little sad. Our extended trip is definitely coming to an end, and we have lost the feeling of open-endedness and freedom that we once had. I'm also a little bit sad to be leaving Sudan without having seen more of it - though we have had the chance to get to know our Khartoum neighbourhood well. 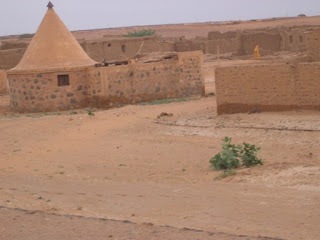 There are so many things I like about Sudanese society - like the communal water idea. I've mentioned how hot it is. Everyone needs to drink. The locals drink the local water. 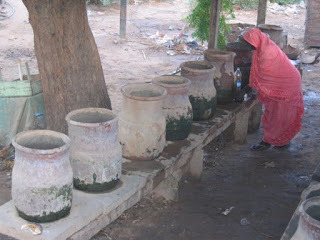 Everywhere are large earthenware containers, usually kept in the shade, filled with water with a tin mug on the side. The water slowly evaporates, keeping the contents cool, and also hydrating the atmosphere. It's a lovely classic answer to the perennial problem of thirst. There's also the more modern option of blokes on the side of the street with large plastic containers of water and a couple of mugs. But I guess that's "progress". Kids also walk around carrying water and clanking mugs together to attract attention, but I have noticed lots of people, specially drivers, have their own mugs in their vehicles, and nip out for a cup of water whenever they see a communal source. and the more authentic, and equally common, source. Souq-el-Arabe is brimful of markets, mostly shoes and perfume it seems, but lots of other stuff too. Max easily managed to replace his dodgy Ethiopian sunglasses with what I suspect is a dodgy Sudanese pair. I have been tempted to buy some furry slippers for somebody, I'm just not sure who. The street sellers make the neighbourhood alive, and it's interesting to see them arrange their fez-like hats, cellphones, books, etc, with real care and attention - and then a little sad to see them sit in the hot sun all day waiting for customers to show interest. 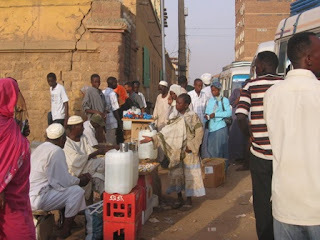 The men of Sudan are much more visible than the women, though we do see plenty of them around the streets of the city, and I've noticed a lot in the grounds of the University. Still, it's the men who have grabbed my attention by praying publicly in the streets - sometimes alone and sometimes in large groups. Every now and then we'll come across someone, on a small carpet or mat, quietly murmuring to themselves and facing Mecca. One day we came back to the hotel, and the entire street frontage was filled with a few dozen praying and chanting men, but we haven't seen it again. And, to my amazement, the men here squat to pee. It might be because they haven't traditionally worn trousers, but even those that do wear them still squat. Fascinating! 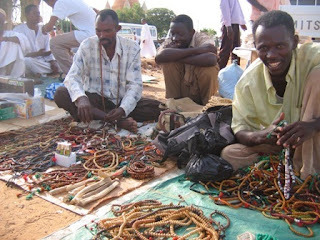 Being a capital city, there are lots of banks and foreign exchange facilities, but we have been very loyal to our local grocer, who unfailingly has cash at hand for our transactions, is speedy and gives us the standard rate of two Sudanese pounds for a US dollar. And he's open on Fridays. There aren't too many English bookshops in town, but we eventually found the New Bookshop, run by a Greek-Sudanese family. The owners' parents had emigrated from Greece in the 1930s. We were looking for a North Africa Michelin map to replace one we'd lost, and asked him if he had them. Yes, he did, but they were kept behind the counter. Apparently the Sudanese government doesn't like the Egypt-Sudan boundary on this map, and he's been raided before by the police for selling publications the government doesn't approve of, and is now a bit more circumspect. Interesting to hear - also interesting to wonder about the Greek-Sudan connection - the Greek Embassy is huge, and the oldest hotel in town is called the Acropole. But all this is now behind us. 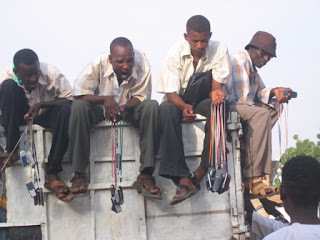 As advised, we were dutifully at Khartoum North railway station at 7am. The train arrived around 8 and left at 8.45, so no surprises there. Embarkation was surprisingly straightforward. Our compartment was easily found, and while simple, was perfectly OK. We made ourselves comfortable for the 36 hour journey, much more comfortable than the poor sods on the roof anyway! 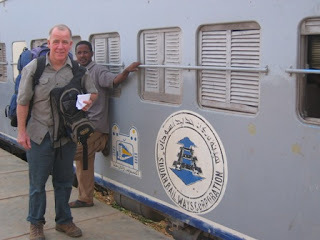 Khartoum North railway station, 8.30 on Monday mornings, before the weekly departure of the train to Wadi Halfa, connecting with the weekly ferry to Aswan, Egypt. It's a nice train, really it is. 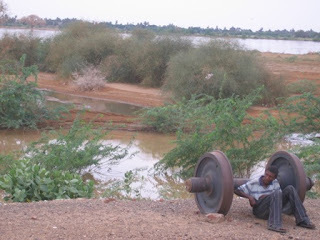 Until Atbara, the train line pretty much followed the Nile - still partially flooded after all the rain. We stopped at Shendi station where we bought felafel sandwiches and a large bag of dates for the trip. 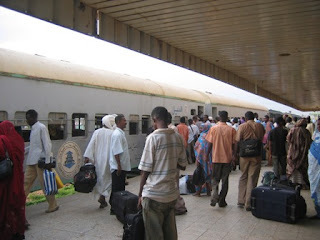 While the train was pretty slow, it was steady, and we got to Atbara (about 300km away) about 7.30pm. We had expected to meet up with Sara here. 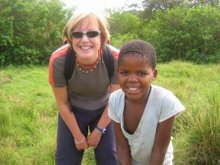 We first met Sara at the Sudanese Embassy in Addis, getting her visa, and then again in Khartoum. 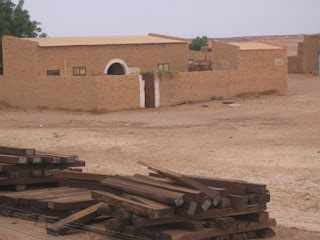 She had been out to Port Sudan, and expected to connect with the train at Atbara, for the leg to Wadi Halfa. Her 14 day visa, like ours, only had a few days left. We found Sara in the dining car, and brought her back to our compartment, where she spent the night on the floor. Better than it sounds, we have our camping mats with us still, and sleeping bags too, so I'm sure she was really quite comfy - better than a wooden bench, or the floor, in third class anyway. The next day the train went mostly through desert. Really bleak, harsh and very, very hot. The hot sandy wind blew all day and our floor and benches were covered in fine dust, as were we. 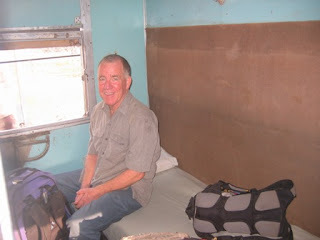 Our expensive compartment didn't run to air conditioning - though we did meet a fellow passenger who told us wistfully he'd last travelled on this train in 1966 when it did have A/C, and he was able to drink a cold beer too. It was a bit of a torment to hear this. Sharia law was introduced into Sudan in 1983, and that's when alcohol was banned, and Islamic dress and behaviour codes were introduced. We'd seen a picture book that had been published in 1978. Khartoum had very few cars, nice tidy roads, and women in Western dress, walking about without their heads covered. Not every woman in the city wears a headscarf, but probably about 95% do. We had heard about some horror journeys on this train, but I have to say our experience was better than expected. 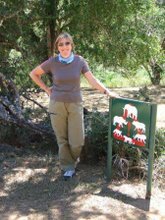 We arrived before time in the re-housed town of Wadi Halfa (an early victim of the flooding required to build the Aswan dam), found our way via an overloaded tuk-tuk to the El Nile Hotel, and then to a bed - not a room, just a bed. But a bed outdoors in this climate is just fine. The hotel had more Westerners staying than we'd seen in a while. 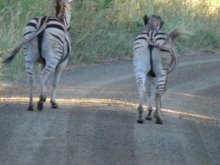 All a bit of a shock to the three of us after our weeks in north Kenya, Ethiopia and Sudan. An overland truck and four 4WDs were heading north, and a few travellers had got off the ferry from Egypt and were heading south. Nice to hang out with some new people and hear some new stories. All was sorted early in the afternoon, and a bus even provided to get us all to the port, two or three km away. The ship was in and so were we, really quite quickly. Again our little cabin was perfectly fine, though without frills and the first class bathrooms were a bit marginal - I could only wonder what life was like on the second and third class decks. There was room for Sara to bunk in with us again, but we spent most of the voyage in the dining room or on deck. Dinner was included in our ticket and about 8.30 we motored past the wonderful temples at Abu Simbel, removed at great cost by UNESCO from the Aswan floodwaters and lit up specially for us (or perhaps the nightly sound and light show??). Anyway, they looked great from the water. Embarkation may have been straightforward, but disembarkation was anything but. The Egyptian immigration guys took over the dining room, and got men and women to queue separately (Europeans were treated as a third group, we had to wait). We retreated to our cabin, propped open the door and provided a chair for old ladies to sit on, and water for those feeling faint. It was a long hot wait in the narrow corridors for everyone else, and we felt pretty sorry for them. Soon though we were to feel pretty sorry for ourselves - told to get our passports stamped, and take our luggage downstairs where we would be let through. But no, not till Mohammed arrived. So we sat downstairs near the exit door, which was guarded by the immigration police, and waited in the stuffy heat for half an hour. The process for the locals seemed to be the official with the loudest voice would should out a name, and a passenger would push himself through the crowd, luggage and all, and get stamped out. Not sure how many people were on board, but several hundred, and I couldn't bear to think that each passenger would be called by name and individually released to Aswan port. Thankfully Mohammed turned up before too long and saved us from having to watch it any longer. 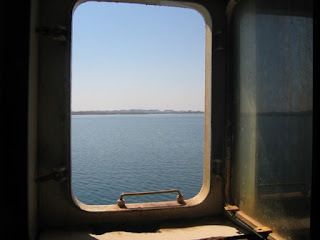 Entering Aswan, as seen from our ferry cabin porthole.